The Xerox Phaser 4600 is a basic monochrome laser printer with impressive print speed. This unit is designed for heavy printing requirements; it has a monthly duty cycle of over 200,000 pages. The maximum print resolution is 1200 x 1200 dpi. The Xerox Phaser 4600 delivers professional text documents and greyscale images. The 256 MB memory can be expanded to 768 MB. Because this is the base unit, the Xerox Phaser 4600 does not have standard networking and also lacks a duplexer. The unit comes in a white and blue enclosure. The Xerox Phaser 4600 black and white printer has a 650-sheet standard input capacity and a 500-sheet output tray, plus a small control panel with function buttons, status display, and numeric keypad. For connectivity, a USB port is on the back. The Xerox 4600 laser printer measures 476 x 541 x 420 mm and weighs 34.6 kg. This impressively fast unit has a speed of 55 ppm. Users can expect good quality output from the reliable Xerox Phaser 4600. It has a high paper handling capacity, which can be further expanded using optional trays. 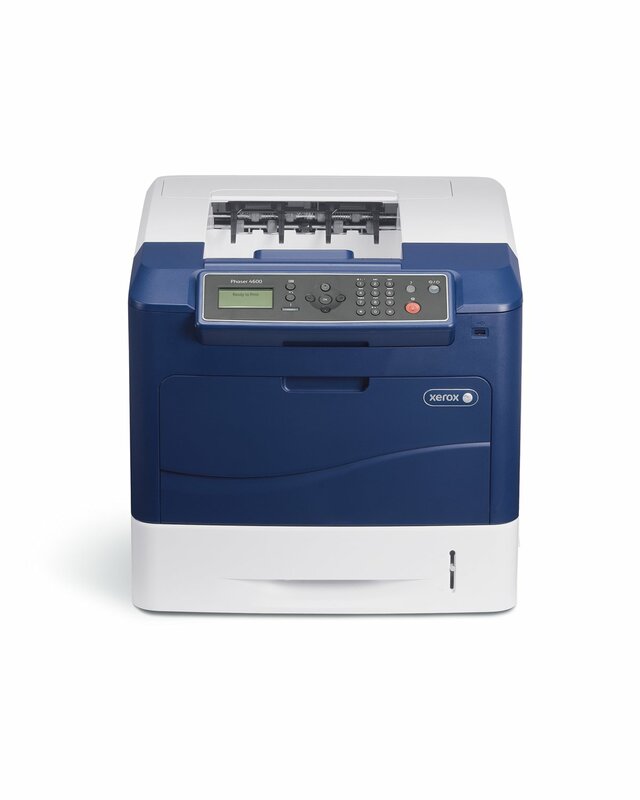 The Xerox Phaser 4600 mono laser printer is easy to use and install. It supports most page description languages. For better cost-efficiency, the Xerox 4600 can accept a high capacity black toner cartridge which will print for approximately 30,000 pages. This printer could be better with the addition of a duplexer for double-sided printing. The Phaser 4600 printer can also use Ethernet or Wi-Fi connectivity for easy networking.